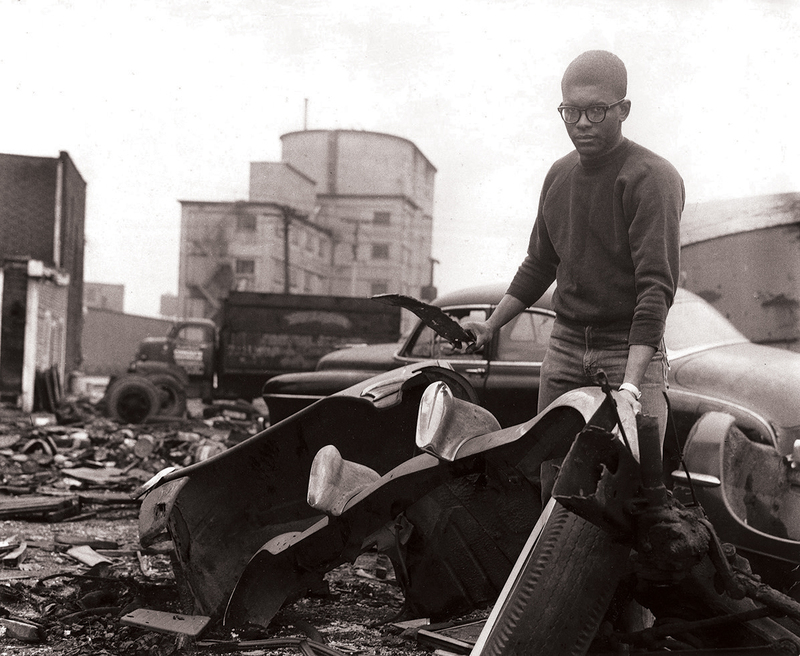 Richard Hunt gathering scrap in a junkyard at Clybourn and Sheffield Avenues, Chicago, 1962. Photo courtesy of Richard Hunt. Art and experimental zoology aren’t the most obvious of pairings, but sculptor Richard Hunt worked in an animal lab at the University of Chicago as a teenager, earning money to pay for college. The result was an influence that has spanned his six-decades-long career, which will be on view in “Richard Hunt: Synthesis.” This exhibition organized by the Georgia Museum of Art at the University of Georgia will be on view from Oct. 20 through Feb. 3. Hunt has created more than 130 large-scale public commissions and helped change the role of public sculpture in the late 20th and early 21st century. He got his start in Chicago, where he was born. His father was a barber from rural Georgia and his mother a librarian, who encouraged his early interest in the arts by taking him to museums. When he was 13, Hunt began attending the Junior School of the Art Institute of Chicago, where his teachers shaped his interest in different working materials. His high school yearbook lists him as a painter and sculptor. Nelli Bar, a German-born sculptor, inspired him to pursue a career as an artist and continued to be a mentor to him for years. He tended animals in the lab from 1951 to 1957 and enrolled in college at the Art Institute in 1953, where he taught himself to weld. Richard Hunt (American, b. 1935), “The Chase,” 1965. Welded steel, 44 5/8 x 66 1/2 x 52 1/2 inches. Snite Museum of Art, University of Notre Dame; Acquired with funds provided by the Rev. Anthony J. Lauck, C.S.C., Sculpture Endowment and the Humana Foundation Endowment for American Art, 2015.005. 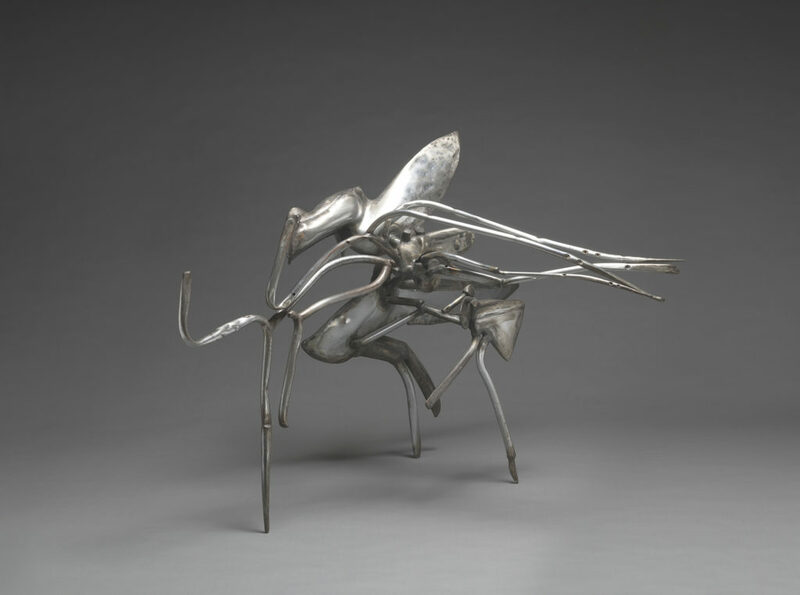 Hunt’s interest in biology (both animal and plant forms) can be seen in his early sculptures, mostly made from found objects. He had early success, with the Museum of Modern Art, in New York, buying one of his sculptures in 1957 and Life magazine naming him one of its “Red Hot Hundred” young leaders in 1962. His career in public sculpture began in in 1967, with “Play,” created for the John J. Madden Mental Health Center. This work marked the beginning of what Hunt called his “second career,” in which he made works that responded both to architectural specifics and the personality of the communities surrounding them. In 1971, a retrospective exhibition at the Museum of Modern Art gave his career even more momentum and recognition. Some works from that exhibition will be in included in “Richard Hunt: Synthesis.” The exhibition traces the phases of Hunt’s career, including through two-dimensional works that show his consistent interest in linear forms. Of particular interest for Georgians, Hunt created “Wisdom Bridge” for the downtown branch of the Atlanta Public Library and a pair of sculptures (“Tower of Aspirations” and “And They Went Down Both into the Water”) for Augusta’s Springfield Park. In addition to public works, Hunt maintained a studio career, constantly experimenting with a variety of media. Galleries at North Carolina A&T State University. This is the second exhibition of his work she has organized, and it draws from public and private collections all over the country. In conjunction with the exhibition, the museum will publish a 120-page hardcover book by Harris that includes an analysis of Hunt’s career, including both public commissions and studio sculpture. It will be available for purchase in the Museum Shop, from Avid Bookshop or online from Amazon.com. The exhibition, publication and related programs are generously sponsored by the National Endowment for the Arts, the Irwin and Hannah Harvey Family Fund, the W. Newton Morris Charitable Foundation and the Friends of the Georgia Museum of Art. A public conversation with Hunt on Oct. 19 at 4:30 p.m. (in the museum’s M. Smith Griffith Auditorium). 90 Carlton: Autumn, the museum’s quarterly reception ($5, free for museum members) on Oct. 19 at 5:30 p.m.
A public tour with Harris on Oct. 31 at 2 p.m.
A Family Day as part of UGA’s 2019 Spotlight on the Arts festival on Nov. 3 from 10 a.m. to noon. A screening of Charlie Ahearn’s documentary “Richard Hunt: Sculptor” on Nov. 29 at 7 p.m.
An Artful Conversation on Dec. 5 at 2 p.m.
A Teen Studio on Jan. 17 from 5:30 to 8:30 p.m. (email sagekincaid@uga.edu or call 706-542-8863 to reserve a spot). All programs are free and open to the public unless otherwise indicated. The exhibition will also serve as the focus of the museum’s fifth-grade tours as part of Experience UGA this year, allowing all fifth-grade students in the Clarke County School District to experience the works of a pioneering African American sculptor.